Figure 1. The location of an implantable cardioverter defibrillator in the upper chest. The electrodes are inserted into the heart through a vein. Sudden cardiac arrest (SCA), also known as sudden cardiac death, is when the heart suddenly and unexpectedly stops beating. When this occurs, blood stops flowing to the brain and other vital organs. SCA usually causes death if not treated in minutes. The heart has an internal electrical system that controls the rhythm of the heartbeat. Problems with the electrical system can cause abnormal heart rhythms, called arrhythmias. There are many types of arrhythmia. During an arrhythmia, the heart can beat too fast, too slow, or it can stop beating. SCA occurs when the heart develops an arrhythmia that causes it to stop beating. SCA is not the same thing as a heart attack. A heart attack is a problem with blocked blood flow to a part of the heart muscle. In a heart attack, the heart usually does not suddenly stop beating. SCA, however, may happen during recovery from a heart attack. People with heart disease have a higher chance of having SCA. But most SCAs happen in people who appear healthy and have no known heart disease or other risk factors for SCA. Ninety-five percent of people who have SCA die from it, most within minutes. Rapid treatment of SCA with a device that sends an electrical shock to the heart (called a defibrillator) can be lifesaving. Automated external defibrillators (AEDs), which are often found in public places like airports and office buildings, can be used to save the lives of people having SCAs. Most cases of sudden cardiac arrest (SCA) are due to an arrhythmia called ventricular fibrillation (v-fib). In v-fib, the ventricles (the large pumping chambers of the heart) quiver very rapidly and irregularly instead of beating normally. When this happens, the heart pumps little or no blood to the body. Death results if the arrhythmia is not treated within a few minutes. Other electrical problems that can cause SCA are extreme slowing of the rate of the heart's electrical signals or when heart muscle stops responding to the electrical signals. CAD occurs when the arteries that supply blood to the heart muscle (the coronary arteries) become hardened and narrowed, causing less blood to flow to the muscle. The arteries harden and narrow because a material called plaque (plak) builds up on their inner walls. As the plaque increases in size, the insides of the coronary arteries narrow, and less blood flows through them to the heart muscle. Eventually, the heart muscle is not able to receive the amount of blood and oxygen that it needs. Reduced blood flow or no blood flow to the heart muscle can result in a heart attack. During a heart attack, some heart tissue dies and turns into scar tissue. This can damage the heart's electrical system, increasing the risk for dangerous arrhythmias and SCA. Very low blood levels of potassium or magnesium. Intense exercise. The hormone adrenaline released during intense exercise can trigger SCA in people who have other heart problems. A tendency to develop arrhythmias runs in some families. This tendency is inherited, which means it is passed from parents to children. Members of these families might have an increased chance of having SCA. Other people are born with inherited structural defects in their hearts that may increase their chance of having SCA. Changes in the heart's normal size or structure can affect its electrical system. Such changes include a heart enlarged by blood pressure or advanced heart disease. Heart infections also can cause structural changes in the heart. Several research studies are under way to try to understand these possible causes of SCA and to find other causes. Each year, between 250,000 and 450,000 Americans have sudden cardiac arrest (SCA). Ninety-five percent of these people die within minutes. SCA occurs most often in adults in their mid-thirties to mid-forties. It affects men twice as often as women. SCA rarely occurs in children unless they have inherited problems that make them likely to have SCA. Only 1 to 2 out of every 100,000 children experiences SCA each year. The major risk factor for SCA is having coronary artery disease (CAD). Most people who have SCA have some degree of CAD. But most of these people don't know they have CAD until SCA occurs. Their CAD is "silent" (that is, it has no symptoms), and doctors and nurses have not previously found it. Because of this, most cases of SCA happen in people with silent CAD who have no known heart disease at the time of the event. Many people with SCA had a silent heart attack before the SCA happened. These people have no obvious signs of having a heart attack, and they don't even realize that they've had one. The chances for having SCA are higher during the first 6 months after a heart attack. Usually, the first sign of sudden cardiac arrest is loss of consciousness, which is similar to fainting. At the same time, breathing often stops and no heartbeat (or pulse) can be felt. Some people may first notice that they have a racing heartbeat or feel dizzy or lightheaded just before they faint. Sudden cardiac arrest (SCA) happens without warning and requires immediate treatment. Rarely is there a chance to diagnose it with medical tests as it is happening. Instead, SCA is often diagnosed after it happens, by ruling out other causes of the patient's sudden collapse. People who may be at high risk for SCA can see a cardiologist (heart specialist) who can decide whether they need preventive treatments. Some cardiologists specialize in recognizing and treating problems with the electrical system of the heart. These specialists are called electrophysiologists. EKG (electrocardiogram). This is a simple test that records the electrical activity of the heart from the body's surface. It's used to detect and locate the source of arrhythmias and other heart problems. It may show whether you have had a heart attack. Echocardiogram. This test uses sound waves to create a moving picture of your heart. Echocardiogram provides information about the size and shape of your heart and how well your heart chambers and valves are functioning. The test also can identify areas of poor blood flow to the heart, areas of heart muscle that are not contracting normally, and previous injury to the heart muscle caused by poor blood flow. There are several different types of echocardiograms, including a stress echocardiogram. During this test, an echocardiogram is done both before and after your heart is stressed either by having you exercise or by injecting a medicine into your bloodstream that makes your heart beat faster and work harder. A stress echocardiogram is usually done to find out if you have decreased blood flow to your heart (coronary artery disease). MUGA test or magnetic resonance imaging (MRI) heart scans. These scans can detect whether the heart has a reduced ability to pump blood. Cardiac catheterization. In this procedure, a thin, flexible tube (called a catheter) is passed through an artery in the groin (upper thigh) or arm to reach the coronary arteries in the heart. Your doctor can use the catheter to determine pressure and blood flow in the heart's chambers, collect blood samples from the heart, and examine the coronary arteries by X-ray. Electrophysiology study. For this study, doctors also use cardiac catheterization to see how the heart's electrical system responds to certain medicines and electrical stimulation. The electrical stimulation helps to find where the heart's electrical system is damaged. Sudden cardiac arrest (SCA) requires immediate treatment with a defibrillator, a device that sends an electrical shock to the heart. Defibrillation can restore a normal rhythm to a heart that is beating irregularly. To be effective, defibrillation must be provided within minutes of cardiac arrest. With every minute of delay in providing defibrillation, the chances of surviving SCA drop rapidly. Special defibrillators that untrained bystanders can use in an emergency are becoming more available in some public places, like airports, office buildings, and shopping centers. These devices are called automated external defibrillators (AEDs). To prevent delivering a shock to someone who may have fainted but is not having a SCA, AEDs are programmed to deliver a shock only if the computer detects a dangerously abnormal heart rhythm, such as ventricular fibrillation. Cardiopulmonary resuscitation (CPR) should be given to a person having SCA until defibrillation can be provided. A person who survives SCA is usually admitted to the hospital for observation and treatment. In the hospital, the heart is monitored closely, medicines may be given to try to reduce the chance of another SCA, and tests are performed to identify the cause of the SCA. If coronary artery disease is detected, the person may undergo a procedure called angioplasty to restore blood flow through blocked coronary arteries. 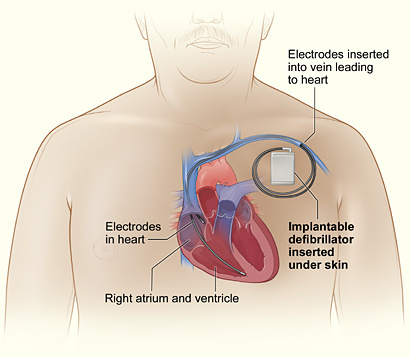 Often, a device called an implantable cardioverter defibrillator (ICD) will be surgically placed under the skin. An ICD continuously monitors the heart for dangerous rhythms. If SCA or another dangerous rhythm is detected, the ICD immediately delivers an electric shock to restore a normal rhythm. Ways to prevent death due to sudden cardiac arrest (SCA) differ depending on whether a person has already had SCA; has never had SCA but is at high risk; or has never had SCA and has no known risk factors for it. People who have already had SCA are at high risk of having it again. For these people, research shows that an implantable cardioverter defibrillator (ICD) reduces the chances of dying from a second SCA. An ICD is surgically implanted under the skin (see Figure 1). It continually monitors the heartbeat and delivers a shock to the heart when it detects a dangerous rhythm. The shocks can be painful, like a kick in the chest. Medicines can be given to try to reduce how often the person experiences the irregular heartbeats that trigger the device to deliver a shock. An ICD is not the same as a pacemaker. Doctors mainly use pacemakers to treat hearts that beat too slowly. However, some ICDs also can function as pacemakers. People with severe coronary artery disease (CAD) are at increased risk for SCA. This is especially true if they have recently had a heart attack. For these people, a type of medicine called a beta blocker can help reduce the chances of dying from SCA. Treatments for high blood pressure, diabetes, and high blood cholesterol also help lower the risk for SCA.